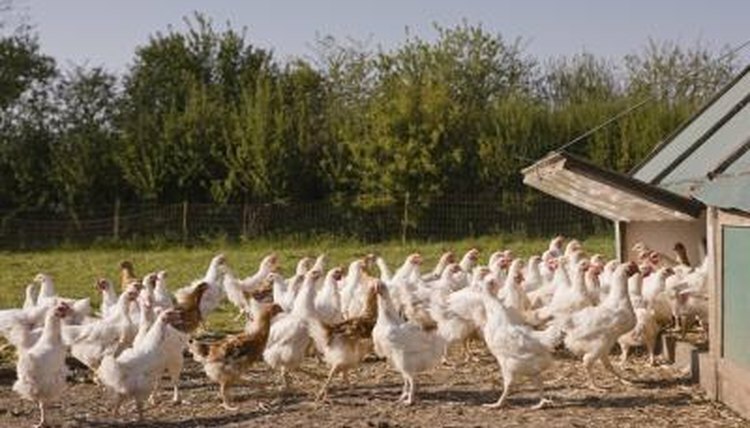 Chickens can contract many contagious diseases through other poultry and wild birds. If you own a flock, you need to determine if your chickens are susceptible to diseases and whether vaccinating your flock is necessary to keep your birds healthy. Your hens don't necessarily need all vaccinations -- their necessity depends on your chickens' exposure and also their history. Vaccinations work by introducing a killed or modified form of the disease that will not cause the disease but will cause the body to make antibodies. When you vaccinate your chickens, your chickens' bodies produce antibodies so that the next time your chickens experience the disease, their bodies know how to defend themselves. In many cases, especially with killed vaccines, you must administer a second vaccination to create a secondary response, which is greater than the first time you gave the vaccination. These antibodies should protect your chickens for as long as the manufacturer states the vaccine is good for. No vaccine is 100 percent effective and some fail to protect, but a vaccinated flock is more likely to stay healthy if your birds are exposed to that disease than if they were unvaccinated. If you purchase new hens or chicks and add them to your flock, you should vaccinate your birds. Quarantining for a month may eliminate many diseases, but diseases such as Marek's Disease can appear months after exposure. Other diseases such as Newcastle Disease are zoonotic, meaning that humans may contract them. Also, when you visit or bring birds to poultry shows or visit other poultry farms vaccinations may be necessary . Lastly, you may wish to vaccinate if your flock has a history of a particular disease or if your area has a disease outbreak. Several vaccines can prevent disease. Marek's disease, Newcastles, infectious bronchitis, fowl pox, fowl cholera, laryngotracheitis and avian encephalomyelitis vaccines are available, but you shouldn't give all of them. Chickens should receive some of them, such as fowl pox and fowl cholera, only if the disease is on your farm or in your area. Consult your veterinarian as to what vaccines would be appropriate for your area. Marek's disease and Newcastles and infectious bronchitis are common vaccines to administer to chicks at the hatchery. Newcastles and infectious bronchitis is usually given to chicks at 10 to 35 days old. Marek's is given after hatching. Fowl pox vaccine can be given to chicks at hatching and young birds at 10 to 12 weeks. Fowl cholera needs to be given twice in 4 week intervals. Laryngotracheitis should be given at 4 weeks of age minimum and boosted yearly. Avian encephalomyelitis vaccine is given at 10 to 14 weeks of age. Consult your veterinarian for the best times to vaccinate.